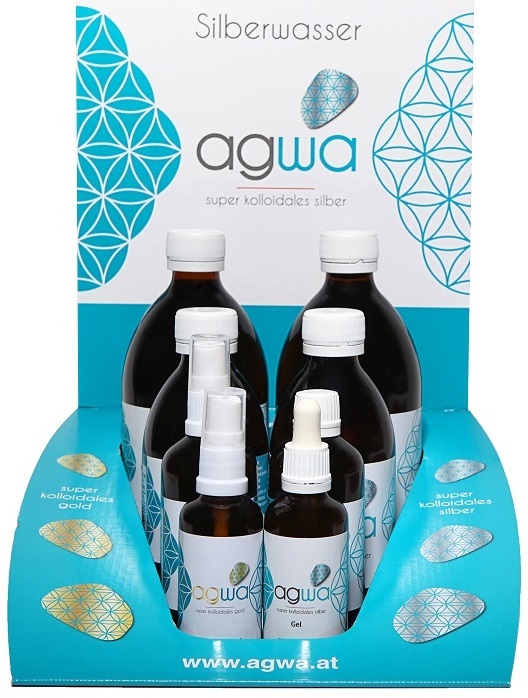 agwa-super-colloidal gold and silver is a particularly high-quality super-colloid, which has originated through the advancement of process- and production-stages over a significant period of time. Each living organism profits from its protective effects. In order to preserve its quality as long and ideally as possible, the bottles should be stored closed, in a cool place and well protected against sunrays. Storage in a refrigerator is not recommended. The bottles should not be kept next to electromagnetic fields, such as, kitchen- and TV-devices. Contamination of the original bottle, especially during usage, as well as contact with base metal and colloids should be avoided. agwa is a non-authorised pharmaceutical product and therefore merely recommended as a consumer good. Due to the especially developed way of production, a new dimension of colloidal precious metals (gold, silver) is offered by ways of stabilty and quality. The products of agwa are first-class super-colloids. Through constant parameters, such as, temperature, purity of all materials, highly professional and hygienic mode of operation, modern technical equipment as well as procedural know-how, for example, special dosage of energy, it is possible to produce agwa super-colloid, a thitherto unknown quality of colloid. Spring water is cleaned from all kinds of disturbing impurities, is de-ionized and restored to its natural, high-quality condition through a special technique. The subsequent enrichment with pure gold and pure silver leads to this unique quality product, which in its purest form (no mixture of ions), represents the greatest possible profit for the customer. Gold-colloid: Two years minimum durability in its original closed condition, six months when open. Silver-colloid: One year minimum durability in its original closed condition, six months when open.